Location. Location. Location. In real estate, they say it is everything. 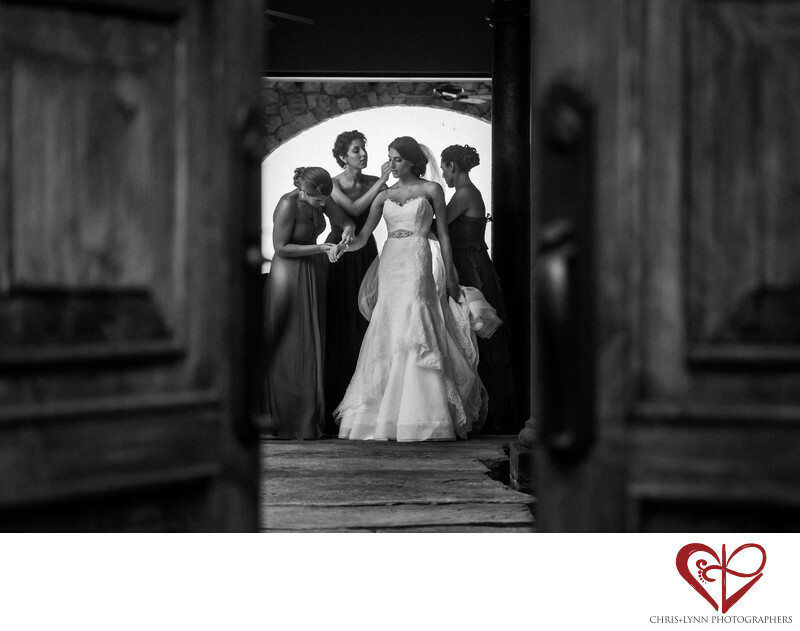 In wedding photography, while it may not be everything, a great location certainly is a blessing! Talia + Sam's Persian destination wedding had more locations than you can shake a cactus at. An evening outdoor reception at Flora Farms Field Kitchen. A church ceremony in the Iglesia San José del Cabo. The groom & groomsmen prep at Hotel El Ganzo. And the bride getting ready at the stunning oceanfront Villa Estero. A fusion of colonial Spanish and classical Roman architecture, the 5700 square foot Puerto Los Cabos oceanfront villa offered ample room for bride Talia, her mother, and 3 bridesmaids to get ready! Chris shot this image of the bridesmaids attending to the bride with a Canon EF 70-300mm f/4-5.6L IS lens, a long telephoto lens he commonly uses for beach wedding ceremonies. Standing in the open-air foyer of the villa, he shot through the mansions grand entry doors to frame the action. We like to have at least an hour to shoot the dress, shoes, stationery, jewelry and other details as well as some photos of the bridal prep such as the final makeup touches and getting into the dress. Two+ hours gives us time to do creative bridal prep images like this one, as well as some nice bridal portraits, and portraits of any bridesmaids and parents present during the bridal prep. To see more of our favorites from this Los Cabos Persian wedding, please see Talia + Sam's featured wedding here. If you are having a destination wedding in the Los Cabos, East Cape, Todos Santos or Pescadero area and are simply looking for accommodation for your guests, there are many vacation rental options available on Airbnb, Homeaway and VRBO. Our personal favorite vacation rental in Baja, Mexico is our own Todos Santos Beach House with Pool & Hot Tub. For more examples of Persian destination weddings in Mexico, please see the Featured Weddings section of the Chris+Lynn website here. Location: Puerto Los Cabos, Paseo de los Pescadores S/N, Puerto los Cabos, 23403 San José del Cabo, BCS, Mexico. 1/1000; f/4.5; ISO 800; 108.0 mm.